Throwing the cardboard tube from the inside of a toilet roll might seem insignificant, but as a product that everyone uses daily, I wonder just how many cardboard tubes from the inside of toilet rolls ends up on a landfill site everyday? The figure must be astronomical, I know my house is full of cardboard toilet roll tubes collected over the last year, stashed away waiting for an upcycle idea to give them a new recycled life. By reducing what we use, reusing what we do need, upcycling, and recycling something once we have no more use for it, we can all make a small difference to the health of our planet Earth. 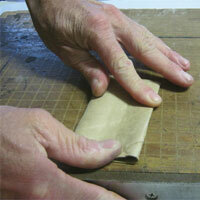 Gently push down on your recycled toilet rolls, and press to flatten them so that they are easier to cut. 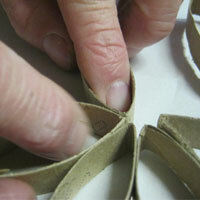 Take your soon to be upcycled toilet rolls, and cut into strips about 1cm wide. 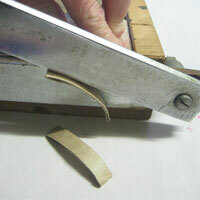 If you have a guillotine, this will make it a bit easier, otherwise use a scissors. 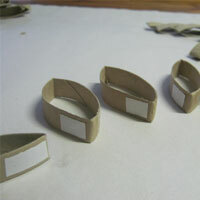 These rings will be your flower's petals. 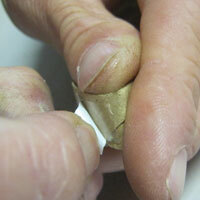 Place a small piece of double-sided tape, about 1cm long, on one side of each petal. Make sure that you stick the tape in the same place on each petal and near the base, where the recycled cardboard is folded. 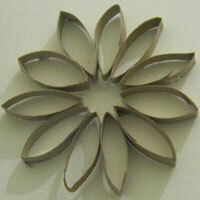 Peel off the other side of the double-sided tape, and stick two cardboard petals together.  Continue sticking your toilet roll petals together to make an upcycled flower. Once you have completed your recycled toilet roll flower, secure each petal with a small dab of construction glue for extra strength. 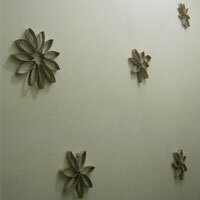 Your upcycled toilet roll flower is now complete. You can use construction glue to stick them to your bathroom wall, or just use a piece of Prestik if you don't want them up permanently. 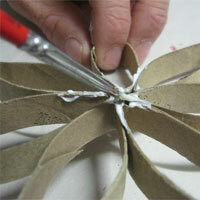 TIP:As an added idea, make a whole lot of recycled cardboard tube flowers, and then thread them together to make a mobile!